As was to be expected, the decks of this century-old home were severely deteriorated and were in need of replacement. This included a covered front porch that ran the width of the home and a small side landing with an entrance into the kitchen. While there was no deck in the rear of the home. there was a small brick porch with steps and a rear entrance to the home. This was completely removed and replaced with a larger deck area and new French Doors were added off the nook and master bathroom with common access to the new deck. With these three areas slated for new decking, we began researching manufacturers for products and systems that met multiple criteria and that also included the requirements set forth by the homeowners. In addition to being beautiful and tying to the home’s architecture, the decking had to be durable and easy to maintain. It’s what we have required of all the products that we have incorporated into this project – inside and out. After reviewing several manufacturers, the answer was found in a unique decking line offered by MoistureShield. 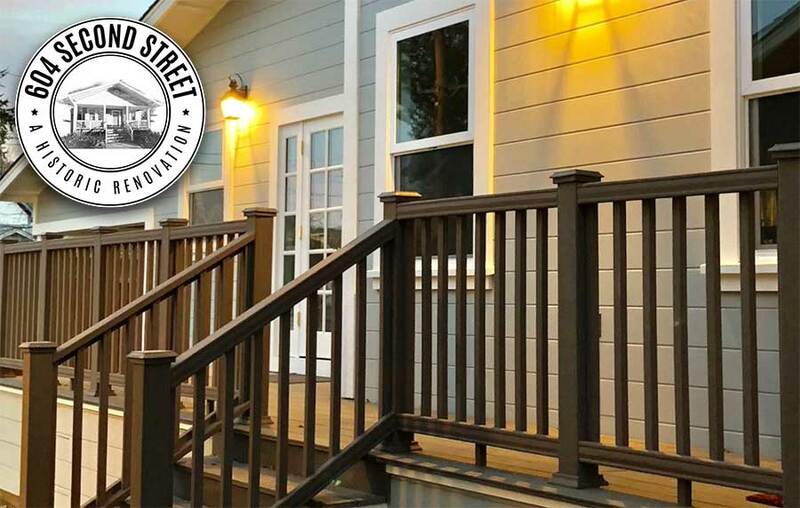 MoistureShield recommended their Infuse composite decking to us, as it provides a more natural wood look that goes well with this 100-year-old home. Plus, it has a fade and stain warranty the homeowners will love. Using hi-tech composite decking was a logical place to start, but adding the many benefits offered by MoistureShield took it to another level. Starting with its exclusive Co-X manufacturing process, MoistureShield Infuse composite decking features an extremely authentic-looking, realistic wood-grain finish, with varied colorations in three dramatic wood tones. For this project, Southern Barnwood (grey) was used. There are very few companies that also offer both composite decking and matching handrail systems and those offered by MoistureShield are outstanding… added to that, are a variety of low-voltage lighting options that can be used to bring a deck to life… and we used many, from post-mounted downlights and post cap lights, to under rail strip lighting and riser-mounted stair lights. The best part is the lighting for all three deck areas can be controlled from anywhere in the house with individual hand-held remotes. Our last home had a large deck that required constant maintenance. It had to be pressure washed a couple times each year and had to be painted every other year. Even then, the dry rot set in and resulted in major repairs. Low voltage lighting is a wonderful bonus that will make our new decks stand-out and that will provide the additional accent and safety lighting needed to make them a great place for relaxing and entertaining.